Almost a year ago I posted that we were about to get back on the tools and start work renovating the hall. That turned out to be a little optimistic. What I didn’t know then was that within a matter of weeks I’d leave my job at the Museum and Art Gallery in Napier to take up life as a full-time writer, based 400 kilometres away in Auckland. 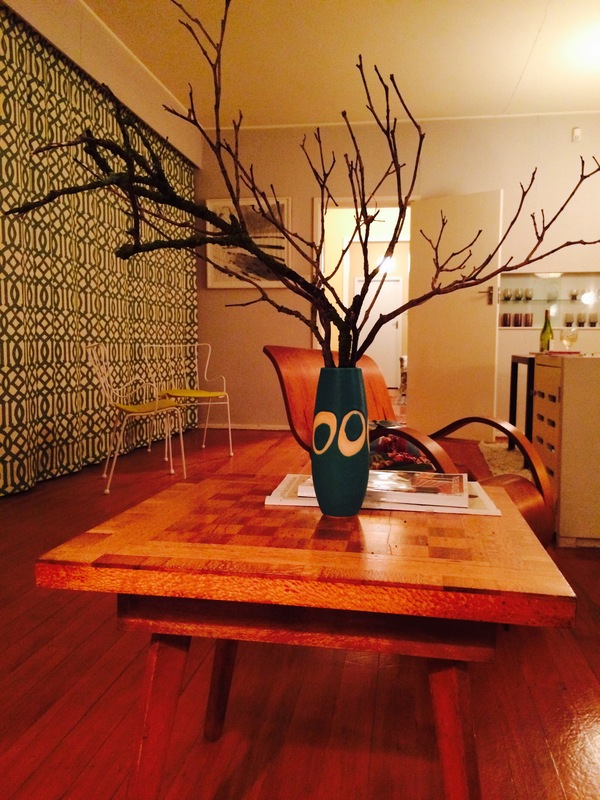 This meant reclaiming our Auckland house – long rented out – and facing up to a great deal of postponed maintenance. Then came the more pleasant task of refurnishing the Auckland house (robinsimpsonhouse.wordpress.com ) in a very different style, which (no surprises here) I did from the local auction house. So Peter and I now live between two cities, occupying two different houses in a complicated relay, which see us spending different periods of time in different zones and relying on house sitters and cat minders to ensure we spend some time together in the same house. Somewhere in this the hallway project got a little lost. That was until the other day when sitting at my desk in Napier, having deposited Peter at the airport for Auckland, I decided that the struggle I was having with a particular piece of writing could be attributed to the influence of the depressing water stained wallboard in the hall and that the time had come to do something about it. 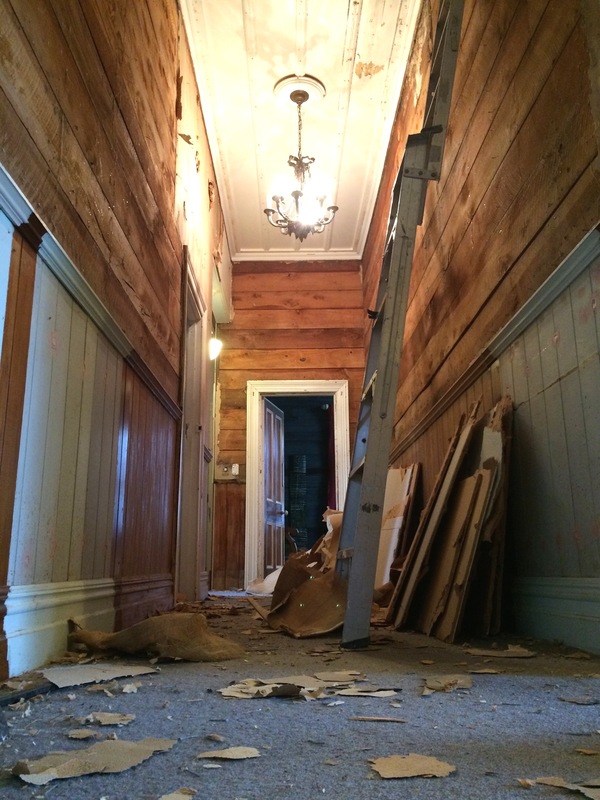 It took three days to strip the hallway of its softboard linings (using a garden spade) and then to remove the numerous nails small tacks and left over bits of hessian still attached from the old scrim wallpaper underneath. 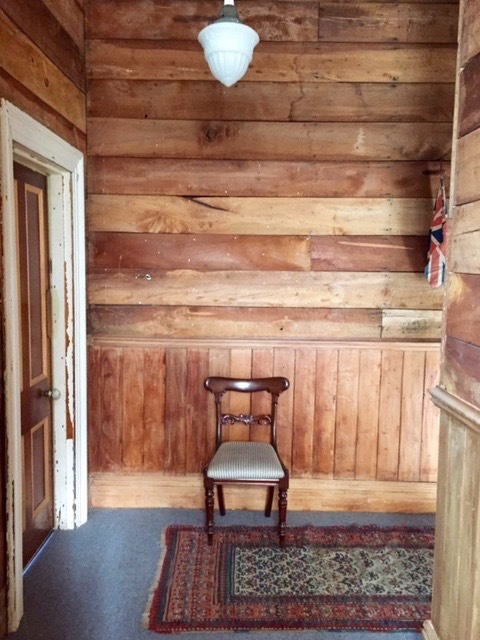 The result was a rather severe hallway lined only with the sarking boards – rough sawn horizontal boards of native Rimu – to be found in most older New Zealand houses. Rimu was always considered the second choice in building after Kauri (NZ Pine) and was therefore used for construction only after Kauri ran out – which it had done by 1906 when Finnis house was built. It is a hard timber that gets harder with age. The heart timber goes a dark red-brown while the outer timber can be almost pale. Sarking boards, cut from Rimu logs, contain both heart and outer board timber. I am always impressed by the appearance of sarking. Its rich brown tones are warm and its surface pleasantly rough. When contrasted with white painted ceilings it looks rather smart. What I find is that you are usually tempted to consider a brown and white colour scheme for the finished space. However the truth is the flatness of paint means you won’t achieve the same feel as exposed timber. Then there is the option of leaving the sarking? The problem is you can almost see the breezes blowing through the hall now. If only there was some middle ground? We will line and paint the hall as planned but for the moment it has been furnished in the starkest manner suiting its new severity. On Peter’s return he took some photographs that reminded us both of those delightfully woody Russian or Scandinavian interiors in country houses or fishing lodges. So just for a moment as I write at my desk in Auckland I’m happy to think of Napier as our little winter Dacha. I like it but Damon…..it’s clean. Rotten auto correct …that should read damn.